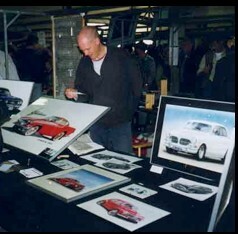 Robert Mittenmaier continues to share his story about his automotive art and how one of his first Ferrari paintings sold almost immediately. 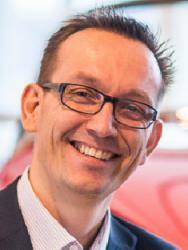 In this blog he shares one of the highlights of his career. I finished my little series of the early American race car after about five or six paintings. After completing that, I met a gentleman who was selling Ferraris at Chinetti Motors in Manhattan – one of the very first Ferrari dealerships in the world. I met Jacques Vaucher while he was working at the dealership alongside racing part time. He approached me to ask if I would create some art to put up on the wall of the dealership. I gave him one Ferrari painting – one of my first. It was a painting of the original dealership that I created based on a written description I found of the dealership prior to its renovations. There were never any photos and so I created the painting from a description I found. The painting sold almost immediately. After that I just started chugging along! I rarely do commissions. I paint what excites me; this is how I produce my best work. I start off doing a lot of research. Then I complete the painting and send it off to my art dealer, Jacques. 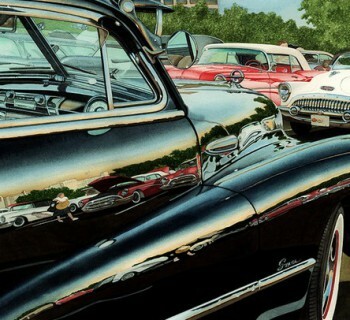 Jacques, by the way, started the very first automotive art gallery in the world when he still lived in Manhattan. He opened a tiny little place on the Upper East Side and subsequently opened two more galleries in the city. He has been my art dealer for 30 years. I have the paintings and he has the contacts. We have a great thing going. One of my paintings is of an early Ferrari racecar. It was in a man named Vince Cunningham’s collection in California. My wife and I headed out west so I could do the painting. It’s a beautiful little car and I painted it in the rain. Seeing cars driving through the rain on my way to work inspired me – the way that a taillight reflects the raindrops. This little Ferrari racecar had a single taillight and I couldn’t stop thinking about what it looked like in the rain. The painting turned out well and I was so glad for the opportunity to explore how rain and water impact the rendering of a vehicle. 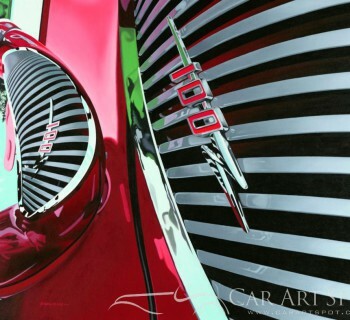 It was featured in Cavallino Magazine – a little publication dedicated to Ferraris and Ferrari racing. 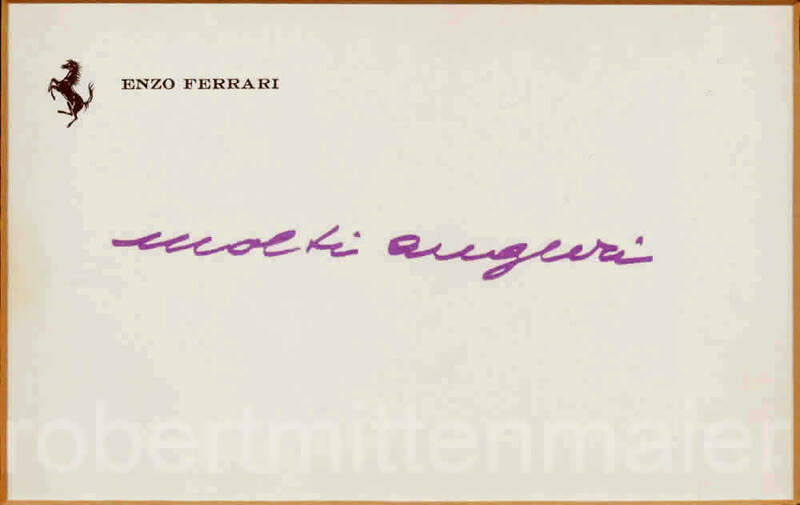 A copy came across Enzo Ferrari’s desk. He saw the painting and told Franco Gozzi, his right-hand man, that he needed it for the book he was working on, “Piloti, Che Gente... ”. Gozzi contacted the publisher of Cavallino who was then in touch with me, relaying the request. But I didn’t have the painting anymore! I had already sold it. Fortunately, I had it photographed before it was given to the buyer. I sent the photographs to Italy – and Mr. Ferrari put it in his book! About six months later, I received a package in the mail. It included a beautiful first edition copy of the book as well as a 3” by 5” business card in it with a picture of a black dancing horse. On the business card written in purple ink is “Many good thanks” in Italian. Enzo is famous for using a purple pen. A few years later, we received a Fed-Ex package from Pierro Ferrari, Enzo’s son. It was an invitation to send a painting to the Ferrari Company for an art show in honour mad memory of Enzo Ferrari. Ever since my visit to the Ferrari factory, graciously organized by Gozzi a few years earlier, I had been working on a painting with of a Ferrari in the factory setting! It was incredibly serendipitous. So, I sent the paintings off to Italy for the art show. My wife said, “Shouldn’t we go to the opening?” But we hadn’t yet been invited. Then, five days prior to the show, an invitation came in the mail and we were on the next plane to Italy. It was absolutely incredible. The show took place in a beautiful palace and we were treated like stars. It was just sensational – and all because of one painting that I had created in my basement out of my own interest. I’ve only had one art show in my entire life. A gentleman who owned a Hilton hotel in Texas called me. He flew us – and my art – out to Texas. That was my only show. I just never have enough art at one time to put on a show. I’ve been so fortunate to have opportunities like this. And it’s all because of the art – the power of art. READ PART ONE of Robert Mittenmaiers interview. Visit Robert Mittenmaier his website to see more of his work.